It's been a while since I've had time to browse the internet at home ware and I miss it so much! While browsing or shall I say lusting I thought it would be great to share a mini mood board of my favourite picks with you all. 1. These are mini hand illustrated porcelain planters from Ohnorachio. 3. I love white furniture - if only I have the space for this 6 seater dining table from Fishpools. 4. Sealoe is one of my favourite places to purchase prints and I have 2 huge ones in my own lounge and this one caught my eye. 5. Can't go wrong with monochrome cushions from Oliver Bonas. 6. This bubble tulip vase is so cute for a huge bunch of hyrdangea. 7. Candles around the home is a must especially ones that look like these which also double up as an decorative item. 8. Lastly finishing touches include a copper clock and I actually have a similar one in my own home. Do any of these items catch your eye? 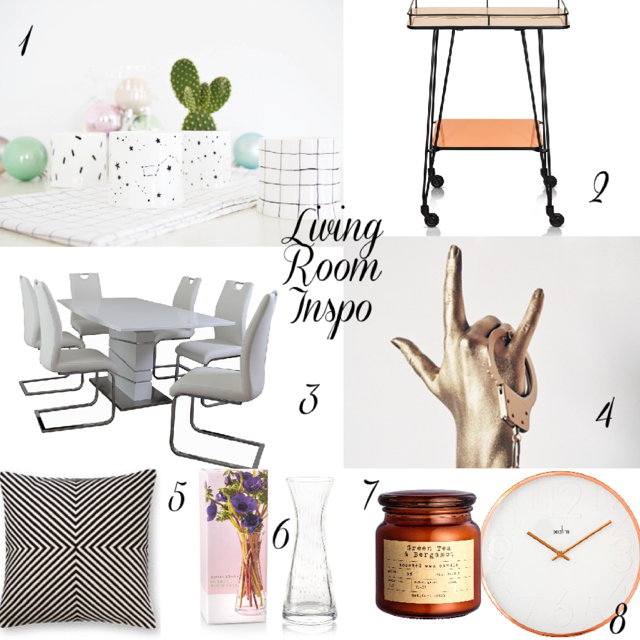 Which is your favourite place for homeware right now?